Save over 60% on Select WESC Apparel! 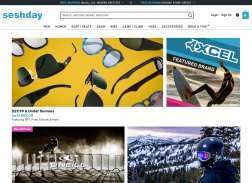 Save 50% on Select Oakley Sunglasses! Get Up to 70% Off Electric Sunglasses! Get Up to 60% Off SMITH Optics! Save 40% on Select Boardworks Surfboards! Save 40% on Select Nixon Watches! Get Up to 65% Off Nixon Watches! Save Up to 60% on TREW Jackets! Get 40% Off Select XCEL Suits! Get Up to 80% Off Imperial Motion Apparel! Get Up to 70% Off Wilder & Sons Apparel! Get 50% Off Select Sanuk Shoes! Save Up to 55% on Select DAKINE Apparel! Get 50% Off Select Quiksilver Apparel! Get Up to 65% Off Nixon Watches.